This instrument is very similar to Epact 86424. The mater is made of two soldered brass plates, one constituting the limb and shackle, the other the plate. The face of the limb is divided into 360? by 5? with further divisions to 1?, numbered 1 to 12 twice every hour or 15?. Suspension is by means of throne, shackle and ring, and the throne is lined on both sides. The rete bears 21 star pointers of the 'wavy flame' type, all named in Gothic lettering. The ecliptic is divided on its edge into 360? by 30?, with further divisions to 5? and to 2?, with the initials of the zodiac signs, and it is connected to the Capricorn band with two ties. The east-west line is counterchanged twice on each side, as is the meridian line which is interrupted at the top end by a band similar to the equatorial line. There are five plates, all engraved with east-west and meridian lines, both tropic and equator lines. All, except for two of them, are engraved with almucantars every 3?, with only the first two numbered '3'and '6', azimuth lines and unequal hour lines marked every even number. The first plate is engraved for latitude 40? and 43?. The second plate is for latitude 45? and its back is blank except for the tropics, equator, east-west and meridian lines. The third plate is engraved for latitude 47? and 51? with almucantars, azimuth lines, and hour lines. The fourth plate is engraved in the same way for latitude 53? and 56?. 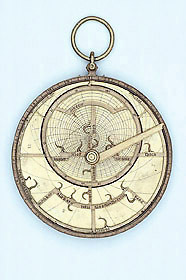 The fifth plate is engraved in the same way for 'Parisi' and on the back has a tablet of horizons and a latitude scale, marked '15' and '90'. The back of the mater is engraved with four quadrants of 90? with 90? at the zenith, divided to 5? and to 1?, numbered from 10? to 90? by 30?. Correspondingly, is a zodiac scale with the initials of the names of the zodiac signs and the 30th degree numbered. Further to the centre is a calendar scale divided into 365 days by 30, subdivided by 5 and by 1, with the initial of the month and its last day numbered. The first point of Aries is on the 22nd of March. Next to the centre is a double shadow square, numbered by four, and unequal hour lines numbered 1 to 6. The rule is simple and lined on the border of the single arm. The alidade is counterchanged and decorated with a simple line. One side is engraved with an unequal scale from 2 (next to the end) to 7 (next to the centre) to 11. Its ends are cusped in Gothic style. There is one sighting hole each vane. The pin is kept by a square screw-nut. See R. T. Gunther, The Astrolabes of the World (2 vols, Oxford, 1932), vol. 2, p.341.